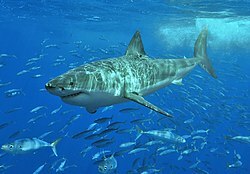 Elasmobranchii is a subclass of Chondrichthyes or cartilaginous fish, that includes the sharks and the rays and skates. Fossilised shark teeth are known from the early Devonian, around 400 million years ago. During the following Carboniferous period, the sharks underwent a period of diversification, with many new forms evolving. Many of these became extinct during the Permian, but the remaining sharks underwent a second burst of adaptive radiation during the Jurassic, around which time the skates and rays first appeared. This page was last changed on 1 February 2015, at 09:16.